Kismat Konnection (Hindi क़िस्मत कनेक्शन ) Urdu: قِسمت کنیکشن, pronunciation: Qismat Connection) is an Indian Bollywood film directed by Aziz Mirza who previously directed films like Yes Boss (1997), Phir Bhi Dil Hai Hindustani (2000) and Chalte Chalte (2003). 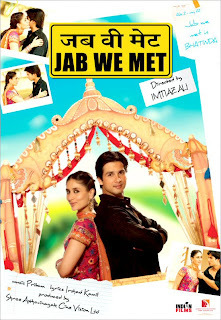 The film stars Shahid Kapoor and Vidya Balan in the lead roles with Juhi Chawla in a supporting role. Bollywood icon Shahrukh Khan is the narrator in this movie. 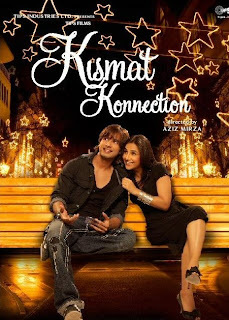 Produced by Ramesh S Taurani under the banner of Tips Industries, Kismat Konnection was released on July 18, 2008. 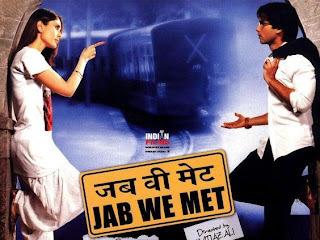 Jab We Met ( Hindi जब वी मेट, ) English: When We Met) is a 2007 Hindi romantic comedy film directed and written by Imtiaz Ali. 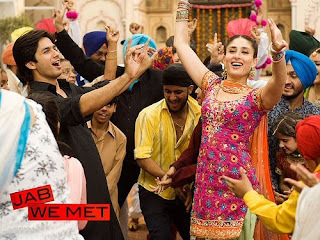 The film, produced by Dhillin Mehta under Shree Ashtavinayak Cinevision Ltd, stars Shahid Kapoor and Kareena Kapoor in their fourth film together. Dara Singh and Saumya Tandon, prominent actors from the north Indian film industry, are featured in supporting roles. The film tells the story of a feisty Punjabi girl who is sent off track when she bumps into a depressed Mumbai businessman on an overnight sleeper to Delhi. While attempting to get him back on board when he alights at a station stop, both are left stranded in the middle of nowhere. Having walked out of his pressurised corporate job, the man has no destination in mind, until the girl forces him to accompany her back home and then on to elope with her secret boyfriend. Releasing in the U.K., a day before its worldwide release of October 26, 2007, the film went on to become a major hit at the Indian box office as well as doing good business overseas. 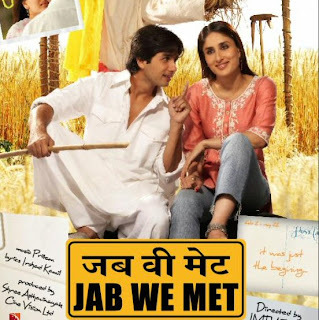 Owing to its success, the distributors of the film, Shree Ashtavinayak Cinevision Ltd, announced that Jab We Met would be remade by corporate entity Moser Baer in four South Indian languages -- Tamil, Telugu, Kannada and Malayalam. Shahid Kapoor as Aditya Kashyap - Burdened by the thought of having to live up to the formidable reputation of his late father, Aditya, a young industrialist is full of angst and despair. He is so busy fighting his own insecurities that he refuses to enjoy life until Geet enters his life. 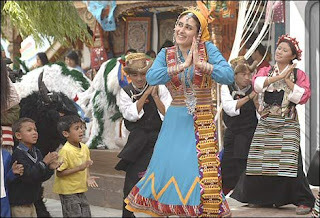 Kareena Kapoor as Geet Dhillon - A Sikh girl from Bhatinda, Geet is the incessant chatterbox who views the world through rose coloured spectacles. “He is a really nice guy and it was fun to work with him. I also enjoyed working with a big star like Rani Mukherjee and also told her that I am a big fan of hers,” she concludes. Well we wonder with Rakhi so charmed by her new prince charming, what happens to the ‘chosen one’ Elesh? Mumbai, Aug 26 (IANS) After a musical chair of titles that ranged from "Star" to "Yahoo", director Ken Ghosh's next film, which has Shahid Kapoor in the lead, has finally been titled "Chance Pe Dance". "Yes, my film would be called 'Chance Pe Dance'. It's final and in fact the first ever title for which I am giving a confirmation. Everything else before this, whether it was 'Star' or 'Yahoo', was merely speculation and, as you would have noticed, no one attached to the cast or the crew ever gave an official statement," Ghosh told IANS. "Now hopefully all rumours would die as the film would hereby be known as 'Chance Pe Dance'," he added. Since information about the title being "Chance Pe Dance" was leaked earlier, why didn't he confirm the news then itself? "Because we hadn't got it on paper yet. Someone else was holding the title and we couldn't have announced it as ours till all the formalities were carried out. "We also had to be careful since the entire bargaining thing comes into the picture when the party that holds the title gets to know that it has been leaked out. However, all is well that ends well since on the Saturday gone by, we finally had 'Chance Pe Dance' as our title," said Ghosh. Considering the fact that the film, which also stars Genelia D'Souza, is a musical, a title like "Chance Pe Dance" does make sense. "You can't ignore the relevance of the word 'chance' here though. Life just gives you one chance and you have to grab it with both hands. This is what happens to my protagonist in the film too who makes best use of the chance available to him. He dances on it...pun intended, and what happens to him from thereon is to be seen in the film," the director explained. 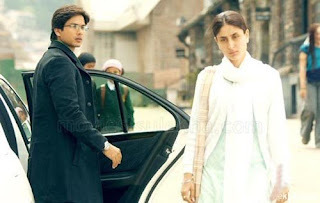 Ghosh had launched Shahid with his "Ishq Vishk" and the director is happy that his protege's "Kaminey" has not only done well at the box office but sky-rocketed him into the top league. "Well, such things do work in favour of your film for sure. But eventually it's the product that matters. His 'Dil Bole Hadippa' is looking good as well and it would be nice to have two successful films behind Shahid when 'Chance Pe Dance' releases", said Ghosh. So when is the movie set to release? "Well, it could be in November or December but, yes, the movie is releasing this year for sure," he said.